Feedback is such an important instigator of growth. And one of the ways we enhance both our growth mindset and our practical skills is by eliciting and valuing feedback. But feedback can be tricky for a number of reasons. We’ve all had experiences of both giving and receiving feedback that didn’t go well or, in some cases, may even have caused real harm and pain for us and others. 1. Permission – There has to be implicit or, ideally, explicit permission for us to give someone feedback. Unsolicited feedback, even if it’s spot-on and valuable, can be hard to take. Asking someone if they’re open to feedback or whether we can give them some, while sometimes awkward, can be helpful and important. This is true even if we’re their boss, parent, or mentor, or in any other type of relationship with them where permission for our feedback may seem implied. Making sure that we have permission to give feedback shows that we respect and value the person to whom we’re giving it. It also usually makes feedback feel less like judgment and more like help, allowing the person to be more receptive to what we have to say. 2. Intention – It’s important for us to check in with ourselves about the intention behind our feedback. In other words, why are we giving them this feedback? Do we genuinely want them to be more successful? Are we annoyed with them and want to let them know why? Are we trying to prove or defend ourselves? Are we trying to control them or the situation? There are all kinds of reasons why we give feedback to others, and sometimes there is more than one. But being real with ourselves about our motivation behind giving feedback can help us determine whether or not it’s even going to be helpful. And assuming we decide that it is, making sure our intention is genuine and positive will make it more likely that the person will be receptive to it. 4. Relationship – The most important aspect of giving effective feedback is the relationship we have with the person we’re giving it to. We can have explicit permission, the most positive intention, and a lot of skill in how we deliver it — but if our relationship isn’t strong or it’s actively strained, it’ll be very difficult for us to give feedback to someone and have them receive it well. I could get the same exact feedback from two different people but react to it differently depending on my relationship with each of them. Let’s say, in one case, I know the person cares about me, appreciates me, and believes in me. I’m much more likely to be open to their feedback and to take it positively. But if, in another case, the person is someone I don’t know as well or may have some unresolved issues with, it’s less likely that I’ll be open and take their feedback well. This is all about personal credibility. Making sure the relationships we have are strong and authentic helps us ensure that we can give feedback effectively when we need to do so. All four of these things — permission, intention, skill, and relationship — are important for us to remember when giving feedback. And they’re also important for us to think about in receiving feedback. The other side of the same coin is making sure that we give people permission to give us feedback, check in with and pay attention to what their intention might be, give them feedback about how they’re giving it or how we like it to be given, and work to strengthen our relationships with the people around us. The most effective ways to enhance our ability to receive feedback are to ask for it, be open to it, and genuinely consider it when it comes our way. Receiving feedback is essential to our growth and success. And the more willing we are to seek it out and take it in, the further along the continuum of growth mindset we can move. What makes giving feedback most challenging for you? What can you do to make it a little easier and more effective? This article is excerpted from Bring Your Whole Self to Work, by Mike Robbins, with permission. Published by Hay House (May 2018) and available online or in bookstores. As a former professional athlete, and as someone who worked in sales and has quite a strong competitive spirit, I know a few things about competition. I’ve also studied it and seen it play out in both healthy and unhealthy ways within teams and companies for many years. Competition is part of life, and especially of business. It can be harnessed in a productive way for teams, but it can also be incredibly damaging and detrimental to the culture of a team or company. So, it’s important to understand that there are two types of competition: negative and positive. Positive competition is when we compete with others in a way that brings out the best in us and everyone involved. It’s about challenging ourselves, pushing those around us, and allowing our commitment and skill, and the motivation of others, to bring the best out of us and tap into our potential. When we compete in a positive way, it benefits us and anyone else involved. Of course, we may “win” or we may “lose” the competition we’re engaged in, and there are times when the outcome has a significant impact and is important. But when we compete in this positive way, we aren’t rooting for others to fail or obsessed with winning at all costs, and we realize that we aren’t “good” or “bad” and that our value as human beings isn’t determined by the result. Positive competition is about growth, grit, and taking ourselves and our team to the next level. However, if we went about these same activities in a positively competitive way, we could still compete to win in tennis or race each other in running or biking. We wouldn’t waste our time and energy attaching too much meaning to the outcome, but instead would realize that by pushing one another past our perceived limitations we would both get a better workout, helping each of us to be as healthy and fit as possible. In a team environment, it’s important to pay attention to competition. We all have the capacity for both negative and positive competition. The more aware we are of our own and others’ competitive tendencies, the more easily we can talk about and pay attention to them when they manifest themselves. Championship teams embrace competition, and harness its positive power to fuel individual and collective growth and success. And creating a culture of positive competition can bring out the best in us and everyone on the team. Are you competing in a positive or a negative way? What can you do to create an environment of positive competition around you? 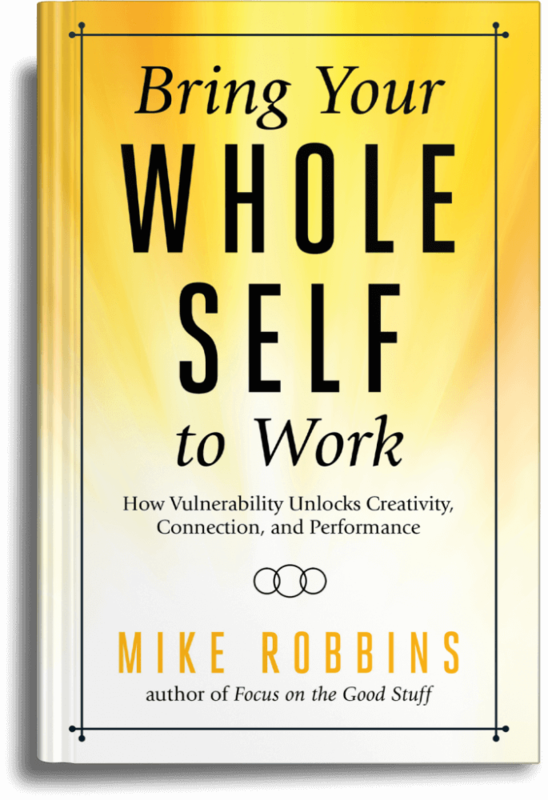 This post is excerpted from Bring Your Whole Self to Work, by Mike Robbins, with permission. Published by Hay House (May 2018) and available online or in bookstores. What are you doing to create a championship team around you at work? What else is needed to ensure the success of your team? Post your reply in the comments. Issues of gender, race, sexual orientation, nationality, age, disability, and religion and more can be hard for us to address authentically, since they bring up things that are both deeply personal and difficult to understand from our various perspectives and worldviews. They also touch on issues of privilege, oppression, bias (both conscious and unconscious), and opportunity. These things can elicit strong emotions and reactions for many of us, for a variety of reasons. For people of any minority group—which means just about everyone except us straight white males—the reality of the group or groups they belong to can raise issues of pride, challenge, identity, and struggle for them, especially at work. Inclusion is about all of us doing what we can to think about, talk about, and be aware of these issues, and about creating an environment that is as open, understanding, supportive, and as safe as possible—which isn’t always easy and can be understandably messy and uncomfortable at times. The term covering was coined by sociologist Erving Goffman to describe how even individuals with known stigmatized identities make “a great effort to keep their stigma from looming large.” Kenji Yoshino, a constitutional law professor at NYU, further developed this idea and came up with four different categories in which we “cover”: (1) Appearance, (2) Affiliation, (3) Advocacy, and (4) Association. In essence, we often do what we can to cover aspects of ourselves that we believe might put us out of the “mainstream” of our environment. Yoshino partnered with Christie Smith, Managing Principal of the Deloitte University Leadership Center for Inclusion, to measure the prevalence of covering at work. They distributed a survey to employees in organizations across 10 different industries. The 3,129 respondents included a mix of ages, genders, races/ethnicities, and orientations. They also came from different levels of seniority within their organizations. Sixty-one percent of respondents reported covering at least one of these four categories at work. According to the study, 83 percent of LGBTQ individuals, 79 percent of blacks, 67 percent of women of color, 66 percent of women, and 63 percent of Hispanics cover. While the researchers found that covering occurred more frequently within groups that have been historically under-represented, they also found that 45 percent of straight white men reported covering as well. Issues of diversity and inclusion impact all of us. And while they clearly play a significant role in the lives and careers of women and members of every minority group, it’s important that we all be willing to look at and talk about these issues, and do what we can do to create an environment that is as inclusive as possible. For us to do this, it takes authenticity, emotional intelligence, and courage – both individually and collectively. A big paradox of being human is that on the one hand we’re all unique—by virtue of how we look, our background, our race, our gender, how we think, our religion, our skills, our personalities, our age, what we value, our histories, our orientation, our socioeconomic status, and so forth—yet on the other hand, the further down below the waterline we go on our iceberg, the more we’re alike. We’re all human beings and we experience the same emotions—love, fear, joy, shame, gratitude, sadness, excitement, anger, and more. If we can be as mindful, sensitive, and aware as possible in honoring, understanding, and respecting our many differences, do what we can do support and empower those who may be underrepresented, and, at the same time, remember that we’re all in this together…then we can create teams, enviroments, and cultures of real inclusion. And, when we do this, everyone benefits. What are you doing to create an inclusive environment around you at work? What else is needed to make sure that it’s as inclusive as possible? Portions of this piece were excerpted from Bring Your Whole Self to Work, by Mike Robbins, with permission. Published by Hay House (May 2018) and available online or in bookstores.